Home » China is on the warpath. Who will be the first victim? China is on the warpath. Who will be the first victim? The head of the People’s Republic of China, Xi Jinping, explicitly stated that the Chinese army was preparing for war. The newly appointed Minister of Defense of the country, Wei Fenhe, no less frankly stated that "challenges to China’s sovereignty over Taiwan are extremely dangerous and will lead to military action." China completed the deployment of its first regimental air defense system, the S-400, the most advanced weapon in the history of world air defense. China has territorial claims to almost all its neighbors. Some kind of logic is present in this - in its time, the Celestial Empire was pretty tweaked by the colonialists. But it is China that is one of the catalysts for breaking the delicate balance that has developed in the world after the Second World War, when the newly established boundaries seemed final. Claims its rights to deserted islands in the South China Sea, which are usually shown on maps as part of the Philippines. It argues with Japan about the Senkaku Islands. China unilaterally moved the border with Bhutan, receiving an extra 270 square kilometers - the whole world, except China, considered them Bhutanese. It claims to the Indian state of Arunachal Pradesh, seized the Aksaychin district and, with thirty years late, recognized India’s sovereignty over the state of Sikkim. It does not really understand why independent Mongolia exists at all (by the way, the Taiwanese authorities only very recently accepted the very fact of having such a state). So the list of countries against which China can use military force is quite large. The main object of the aggressive aspirations of the People's Republic of China, of course, is ... The Republic of China. More known to us by the name of its largest island - Taiwan. From time immemorial, he was part of China, but after the victory of the communists in the civil war of 1946-50. It was on Taiwan that the former leaders of the country, headed by Chiang Kai-shek, fled. The small island was supposed to be their last refuge and at the same time the grave, but the new Chinese authorities made a diplomatic miscalculation. No one particularly protested against Mao’s intention to drive Chiang Kai-shek off the island, but Beijing and Washington had a different relationship for a different reason - the Chinese decided to help the Korean northerners with communists, and the United States defended the southerners. And as a minor revenge, the Americans announced their actual protectorate over Taiwan: Beijing was given to understand that an attack on Taiwan would be equated to an attack on the United States. For many years, it was the Taiwanese regime that, contrary to logic and evidence, was considered “the only legitimate government of China”: the Americans, and after them other Western countries, recognized mainland China only in 1979, at the same time formally breaking off relations with Taiwan. That Taiwan is China, everyone agrees. The island is sometimes proposed to hold a referendum on declaring state sovereignty, but as a preventive measure, Beijing adopted the law “On Countering the Split of the Country”, which clearly refers to “non-peaceful measures” to be taken to protect the territorial integrity of the country. Taiwan was given to understand that holding a referendum was tantamount to inviting Chinese forces to the island. At the same time, the proposal of Beijing for purely peaceful reunification remains open. The conditions are simple - the same as they were when the return of Hong Kong and Macao: for fifty years Beijing will not interfere in the affairs of the island, according to the principle of "One country - two systems", he is even ready to leave Taiwan with its armed forces. This would probably be the best solution to the problem, however, despite all the guarantees, the Taiwanese elite fears for their fate and, perhaps, not without reason. The US is doing its small business for the future conflict: they help Taiwan openly and covertly. The Americans sold them engines for military aircraft, thereby spoiling relations with China. However, at the military level, these relations have long been far from ideal. Chinese ships regularly meet with the US in neutral waters, and sometimes in the territorial waters of China (according to China itself), and these meetings are not at all friendly. Moreover, the fleet of China in recent years has been patrolling the environs of South America, which the United States has become accustomed to regard as its undivided property. The second important direction for the possible aggression of China is India - do not count the number of border conflicts between these countries. Large-scale battles have not been there until now only because it is very difficult to conduct ground operations at an altitude of four to six thousand kilometers. Half of the losses in these clashes are not killed, wounded or captured, but missing in the gorges and on the glaciers. At the official level, smiling understanding is now reigning between Beijing and Delhi, but one can no more believe a Chinese smile than an American one. In the so-called Siliguri corridor, also known as the “chicken neck” on the border of China, Bhutan and India, there is now a very tense situation: only one random shot is enough to start fighting. But India, moreover, has given asylum to the so-called government of Tibet in exile and the Dalai Lama. Not a single state in the world recognizes the independence of Tibet, this would mean a sharp conflict with China, but Tibetan separatism, of course, delivers a certain headache to Beijing. Moreover, the United States, wishing to annoy Beijing in 1991, formulated: "Tibet ... is an occupied country according to recognized principles of international law ... The real representatives of Tibet are the Dalai Lama and the Tibetan government in exile." This defiant statement did not entail any continuation, although after such phrases it would be logical to establish diplomatic relations with Tibet. But the United States prefers to use the Tibetan question exclusively for its favorite rhetoric about human rights, the protection of which, as is well known, can justify any actions. And finally, the Philippines. China consistently appropriates islands in the South China Sea, ignoring the decision of the International Tribunal. The Hague is far away, and the islands and the water area are such cute and desirable. Scarborough Reef, Spratly Archipelago, Paracel Islands - not only romantic names, but also significant hydrocarbon reserves. Vietnam also participates in territorial disputes, but at this stage China is unlikely to be seriously associated with it - in the border clashes of the First Socialist War, the Vietnamese have shown themselves to be extremely dangerous fighters. However, Hanoi cannot consider itself completely safe. As for the Philippines, more recently, the country's sea conflict with China seemed inevitable. But in 2016, authoritarian politician Rodrigo Duthert won the presidential election, saying that the country’s foreign policy was completely reversed: “I will go to Russia to tell Putin that from now on, we are three, China, the Philippines and Russia, against the rest of the world. There is no other way. ” Behind these words, there was an actual capitulation to China’s territorial claims in exchange for the right to participate in the development of fields and China’s support of a kind of internal policy to Comandante Duterte. Empires rise and collapse. 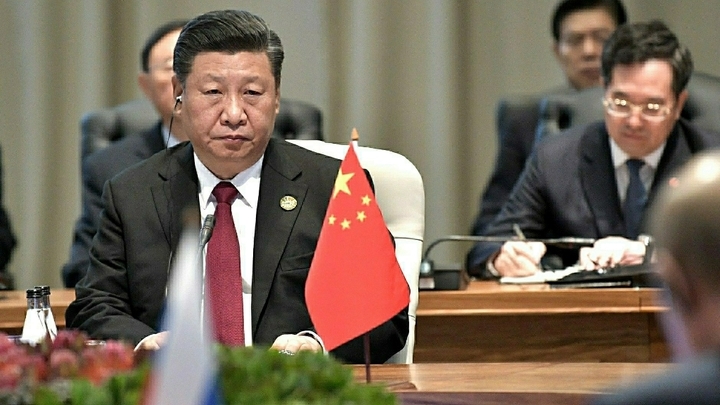 ... Now the empire of Chairman Xi Jinping declares his readiness not only to become the third state after Russia and the United States with the tacit right to initiate armed conflicts or be included in them outside of its territory (China has been doing this before), but also to protect its zone of influence from other global players.